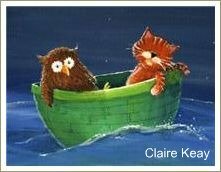 The Owl and the Pussycat is a delightful nonsense poem written by English artist and poet Edward Lear. The poem was written for a three-year-old girl named Janet Symonds who was the daughter of Lear's friend, poet John Addington Symonds, and his wife Catherine. 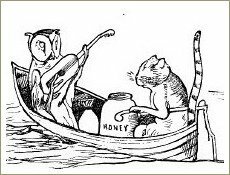 The Owl and the Pussycat was first published in 1871 in a book called Nonsense Songs & Stories with Edward Lear's own illustrations, including the one on the left. Since then it has been set to music and animated many times over the years. The Owl and the Pussycat is typical of many of Edward Lear's poems which often feature anthropomorphic animals – animals who behave like humans. It tells the story of the love between the owl and the pussycat who sail away to marry in the land 'where the Bong-tree grows'. The poem contains quite a few made-up words which was something Edward Lear loved to do. Reading nonsense poems like these with children is fun but it also is a brilliant stimulator of phonological awareness, a really important pre-reading skill. If you'd like to hear a reading of The Owl and the Pussycat, click here.